Take a look at the cleaning products underneath your kitchen sink or in your bathroom closet. Read the label. Aside from water, you probably can't pronounce any of the ingredients. Many of these chemicals are toxic to your dog. This is why I decided to show you how to make homemade cleaners that are safe for dogs. Whether you want to clean your windows, carpeting or you're just looking for a safe and effective all-purpose cleaner and you've got pets in your household, I've got a recipe for you! Many dog owners don't think about the necessity of pet-friendly cleaning products, and the chemicals they use around their home and the safety of these products. If you're using cleaning products that are full of toxic ingredients, they may be ingested by your dog. Wondering how that's happening? 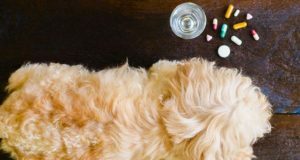 Think about your dog's normal daily routine and you'll quickly realize just how these chemicals are getting into his system. For example, if you clean your floor with a chemical cleaner (which many of us do), your dog walks on it all day. This household cleaner will get onto the dog's paws, which he will probably be licking in just a little while. He may also use his paws to hold chew toys or bones. The chemicals will get onto the dog chew and your dog will end up ingesting them. Does your dog ever lick the windows or glass doors in your home? Do you use chemical cleaners to wash the glass? If that's the case, you may need to change what you use. Do you use an all-purpose or kitchen cleaner that is filled with chemicals? You should not set your dog's food or treats on the counter before feeding them to him. The same applies to floors, unless you're using some type of antibacterial dog feeding mat for protection. There are hundreds of ways that the toxic chemicals in commercial cleaning products can leech their way into your dog's body. While you probably won't notice any health issues right away, over time these toxins could lead to the development of serious diseases like canine cancer. Learning how to make homemade cleaners that are safe for dogs is easier than you may think. In fact, you probably already have the ingredients that you'll need in your pantry. So, let's get to it! The recipes below will result in great pet-friendly household cleaning products that will be safe for all the members of your family, whether two- or four-legged. The first and most popular product you'll need to have at home is something you can use in most places. So if you're interested in learning how to make homemade cleaners that are safe for dogs, you're going to need a good pet-friendly all-purpose cleaner. As you can see, it's very simple and it actually works very well. The mixture makes a great cleaner for counter tops, coffee tables or anything else that needs a quick wipe down. Most importantly, it's going to be completely safe for the dogs in your household. The next thing most pet parents need is a homemade pet-friendly bathroom cleaner. Fill the rest of the bottle with water. If you're learning how to make homemade cleaners that are safe for dogs and you want them to have a pleasant odor, you can add a few drops of essential oils to give the cleaner the scent of your choosing. We all need to clean windows from time to time, so having a homemade dog-friendly glass cleaner that actually does the job in your arsenal is never a bad idea. Here's what to do. The above recipe for a traditional glass cleaner. It works great, but will take time to dry. When you have a puppy at home, accidents are bound to happen and you'll need to deal with removing the odor and stains from the carpet. However, puppies aren't the only ones leaving stains in the carpet, so you need to have something to deal with all other stains. Carpet stains are tricky to get rid of, and even some of the toughest commercial cleaning products have a tough time. If you're going to learn how to make homemade cleaners that are safe for dogs and expect them to get rid of carpet stains, you'll need to use a little extra elbow grease too. First, blot the stain with a paper towel. Sprinkle a liberal amount of baking soda on the stain. Combine 1/2 cup of 3% hydrogen peroxide with a teaspoon of dish washing liquid. Pour this mixture onto the baking soda, and scrub the stain with a clean cloth. Let the cleaning mixture sit for 10 minutes and then vacuum the spot. If it's a set in stain or a really tough one to remove, you may need to repeat the process a few times until you finally get rid of it. Because our pets spend so much time walking and lying on our floors during the day, this is one of the most important areas of your home to keep clean. Ideally, you have one of the best types of flooring for dogs. They're going to be pet-friendly and much easier to clean. You can keep your mop and bucket, but just switch out the floor cleaner for something like white vinegar. Use a ratio of 1 gallon of hot water to 1 cup of distilled white vinegar to mop your floors. You may want to add some essential oils to cover the vinegar smell. If not, don't worry. The smell of the vinegar dissipates very quickly, and with this ratio the odor is not very strong to begin with. Did you know lemon juice is a great grease-cutter? It's actually the best natural cleaning agent for tough grease messes in the kitchen. It's also great for getting grease off of kitchen cabinets, stove tops and range hoods. As I mention in my video guide above on how to make dog friendly homemade cleaners, our pets love drinking out of the toilet. If you forget to close the lid, they love taking a drink of toilet water. First of all, eww! And second of all, it makes me think twice before using commercial cleaners to clean the toilets in our house. Vinegar is a great substitute for commercial toilet cleaners. While it probably doesn't taste very good, it's not toxic and won't hurt Fido if he ingests some of it. Simply dump 1 cup of white vinegar into the toilet bowl, slosh it around with your toilet cleaning brush, let it sit for 10 minutes and scrub your toilet clean. I hope you find this useful and can use these dog-friendly homemade cleaner recipes in your home. Do you have a favorite homemade cleaner that is safe for pets? Please share the recipe in the comments below so other pet owners can benefit from it too.